Brainstorming und Concept Maps können Studierenden helfen, ihr Informationsbedürfnis zu definieren, Kernbegriffe zu finden und diese dann zur Informationssuche im Bibliothekskatalog und Datenbnaken zu verwenden. For many graduate students the process involved in producing a capstone project, master’s thesis, or PhD. dissertation is an intimidating mystery. Coursework does not adequately prepare them for the rigorous demands placed on their time and mental energy in the pursuit of an original research idea. 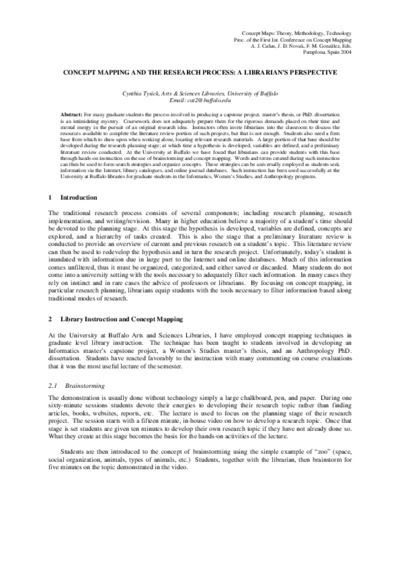 Instructors often invite librarians into the classroom to discuss the resources available to complete the literature review portion of such projects, but that is not enough. Students also need a firm base from which to draw upon when working alone, locating relevant research materials. A large portion of that base should be developed during the research planning stage; at which time a hypothesis is developed, variables are defined, and a preliminary literature review conducted. At the University at Buffalo we have found that librarians can provide students with this base through hands-on instruction on the use of brainstorming and concept mapping. Words and terms created during such instruction can then be used to form search strategies and organize concepts. These strategies can be universally employed as students seek information via the Internet, library catalogues, and online journal databases. Such instruction has been used successfully at the University at Buffalo libraries for graduate students in the Informatics, Women’s Studies, and Anthropology programs.